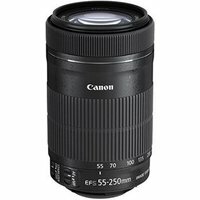 The The Canon EF-S 55-250mm f/4-5.6 IS STM Lens offers a flexible focal range and is the perfect companion for photographers looking to get up close to wildlife and capture the action. Canon's STM technology enables smooth, quiet continuous focusing when shooting video and fast accurate AF when capturing stills. The lens is Canon's first EF-S telephoto zoom lens to feature advanced STM technology, alongside a 3.5-stop optical Image Stabiliser, providing outstanding stills and movie quality throughout the entire zoom range.